During the months of February, March, and the first half of April, visitors to the Alden B. Dow Home & Studio will have the opportunity to view special thematic displays of seldom-seen drawings and designs from the Archives. Drawings, photographs, and related textual materials will be on display in the Second Drafting Room from 1:00-5:00 pm, Monday-Friday. Throughout his long career, Alden B. Dow designed more than 200 projects that were never built. Most were proposed homes of all types and sizes, some of which truly pushed the boundaries of residential architecture at the time. Also among the unrealized projects are a nursery school, church, theater, shopping center, and even a boat house. Ranging from the extravagant and fanciful to the practical and affordable, the drawings and sketches on display are works of art in and of themselves. 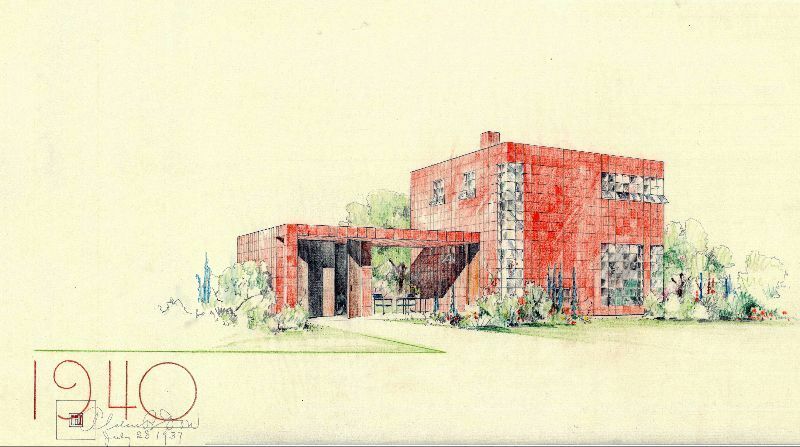 When designing a home or building, Alden B. Dow always considered the site an important part of the project. Instead of solid walls, living spaces were often graced with floor to ceiling windows, breaking the barrier between structure and nature. 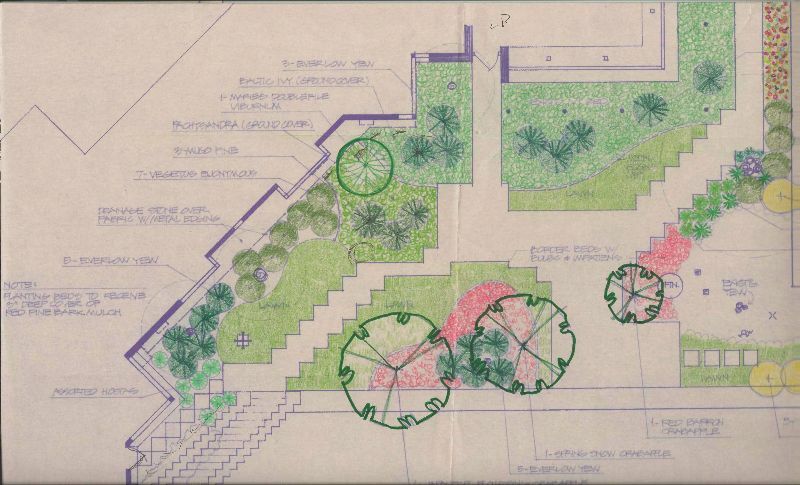 With the enormous appreciation for nature instilled by his father and mother, his drawings for homes, churches, and other structures sometimes included detailed landscape plans showing the exact locations of specific types of trees, shrubs and flowers. 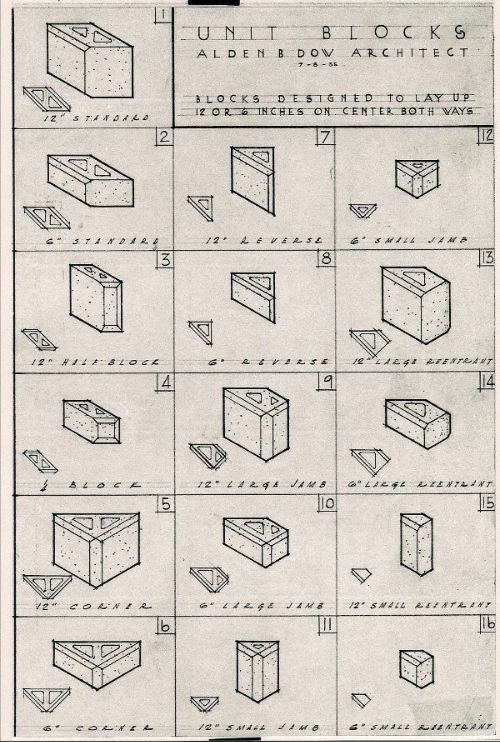 Beginning with the design of the Unit Block, Alden B. Dow prepared drawings and applications for patents on 10 other inventions during his lifetime. Out of his creative mind came ideas for Sandwich Construction Panels, Plastic Windows, and Structural Facing Units. In addition to these building products, he also dreamed up and actually received patents for a fur-like insulation material for the outside of a building, as well as a self-choreographing musical or luminescent appliance that he called the Moodical.